Lovely photos! You look so cozy and chic! Your photos are gorgeous! 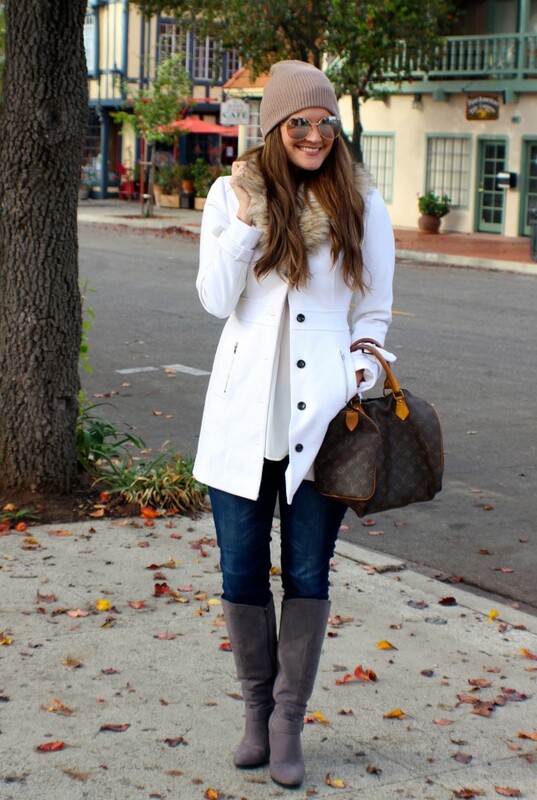 Love your winter white coat! Love the fur collar on that coat! So chic! How much fun! I love wine country, I really wish we lived closer. You look adorable! 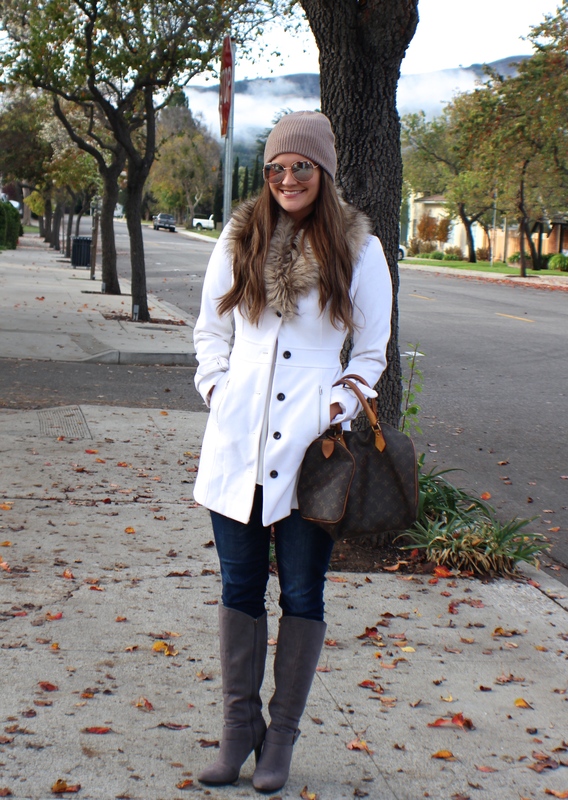 Love the crisp white coat paired with the grey boots – such a great look! I really love this coat! It’s a great colour, and such a classic shape. So beautiful! Small towns like that are so fun and full of charm. Love, love, love that coat! The fur collar and detail at the waist are perfection! So beautiful outfit dear!! I love that white coat! Love the fur on the jacket! So cute! You could not look any cuter in your coat, hat and boots! Great style! I love that gorgeous white coat!!! Sounds like such a cute little town! Christmas will be here before we know it! Hey there! Thanks for stopping by my blog! Love this look, the coat is gorgeous as are your boots! How fab is that coat?! I love the white and fur! Gorg! Oh my!! You look soooooo beautiful. Love your hair, your boots, your coat, your glasses…. That sounds like such a fun and festive place to visit! I love what you wore–that white coat is so crisp and beautiful! I love the sunglasses. Thanks for sharing and happy Thursday. 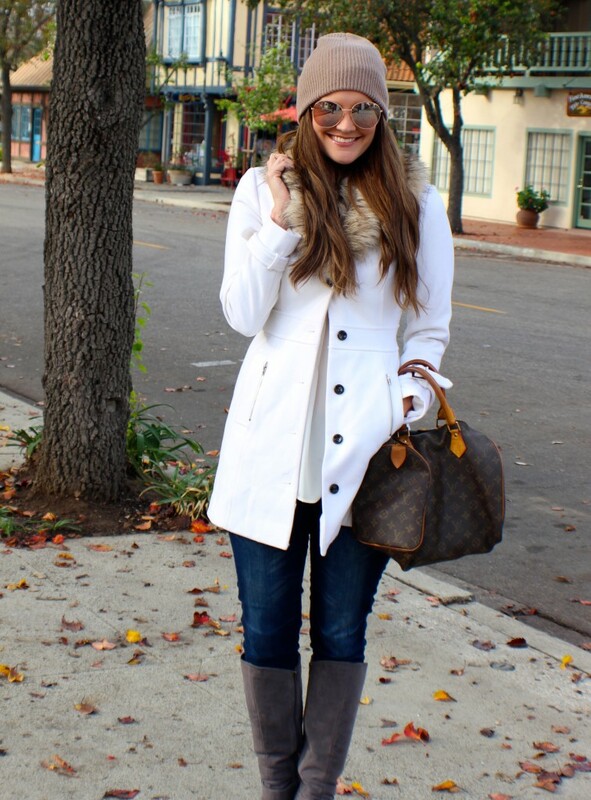 This white coat is gorgeous! 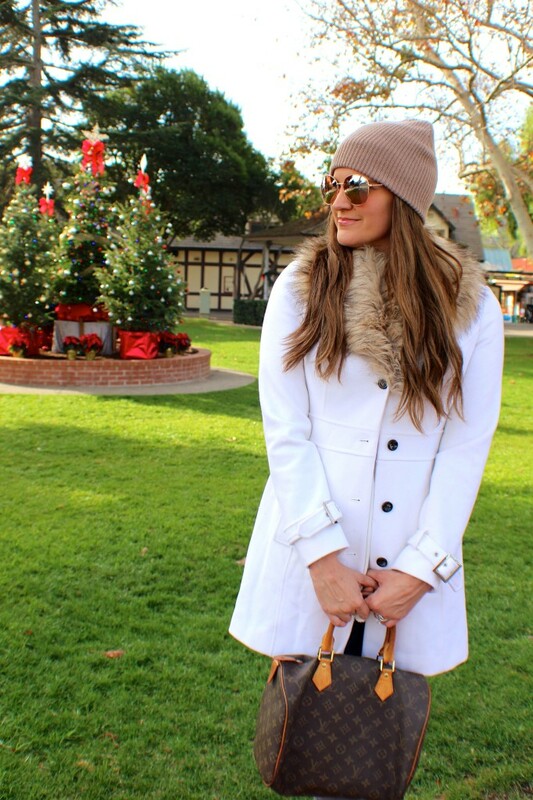 I see a lot of ivory colored winter coats, but never white, white! It’s so crisp and pretty! 🙂 You look fabulous! Such a cute, comfy look! Very nice outfit, you look so cute! That’s a very beautiful outfit, I love white coats and knee length boots! You look very beautiful! Okay, I am in love with those boots! You look fabulous and warm at the same time! Sounds like such a cute place. I love your white coat, just beautiful. Never heard of that place, but it looks so cute. Who would have thought. I love your white coat. It looks gorgeous. I just love your Winter white coat. The style is stunning and you’ve styled it beautifully with your boots and beanie. You look fantastic. I love these photos too, I can see why you love it there. The grey boots, white coat and beanie! What a stylish and chic outfit!! Hope you had such a wonderful time! I remember seeing this outfit on your instagram and lusting after that coat! I love this whole look. Love the hat and sunglasses too! You look so winter chic.